Ok—so I must confess. What do I like to do most in my free time? Yup, you guessed it—look at old buildings just like the ones I’m working on, especially old houses. So last week, when Preservation Long Island teamed up with the Yaphank Historical Society and Suffolk County Historic Services for a “behind the scenes” peek, mid restoration, at the historic Homan-Gerard House in lovely Yaphank, Long Island, I was there! The Holman-Gerard House, ca. 1910. The mill is partially visible to the right. Photo from the Yaphank Historical Society. And what could be better than this, folks, for an historic house architect? The Federal style Homan House dates to ca. 1790 (although new evidence suggests it may be as late as 1820), and restoration is underway but not completed. Walls and ceilings were opened up. The south side of Holman house in 1962, showing a wrap around porch with Queen Anne style posts. The porch no longer exists. Photo from Preservation Long Island’s archive. The south side of the house today, facing the millpond. The quarter round windows at the attic never contained glass, confirmed by historic analysis that shows the painted out black boards are original. Photo from Preservation Long Island’s archive. Some original finishes and fragments of wallpaper and trim from the layers of lives lived in this house (and the inhabitant’s tastes) from the past two centuries were still in evidence. Original plaster lath was showing, and some of the original paint colors, confirmed by paint analysis, had been applied to trim, in preparation for final painting. Bark still clings to the attic sheathing behind a plaster wall. We went to the attic and looked at original pegged beams. We climbed into the cellar, where a 21st century structural intervention was preventing the house from collapsing in on itself. What could be more exciting? This was hog heaven! The entry hall as it looked in 1962. Photo from Preservation Long Island’s archive. A little background: the house is owned by Suffolk County and is part of the Suffolk County Historic Trust, and for the last 65 years the house has been abandoned. The County owns more than 200 historic properties, ranging from modest farmhouses of the Colonial era, some Gilded Age mansions from the early 20th century, and even a dude ranch from the 1930s. With little funding for historic preservation, the County has a tough row to hoe taking care of these buildings. So their priorities are often to stabilize them—new roof, protect the windows, stop leaks—until such time that they have the financial resources to restore them. They often look to “Friends” groups to partner with to raise funds and create programming for historic properties once restoration is completed. When the LIE was being built the house had been abandoned for years. Vegetation and neglect had taken their toll, but the beauty of this exceptional house was still visible when this photo was taken in 1962. Photo from Preservation Long Island’s archive. For six decades at Homan House vegetation ran rampant, water found its way in through the roof, animals climbed in and made homes for themselves, and most recently Homan House looked like it might not survive. 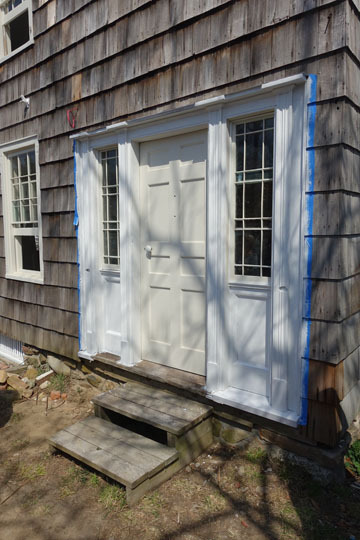 The front door facing Yaphank Avenue, freshly painted the morning of our tour. Detail showing the restoration of the original thin wood frame applied over the window glass on both sides at the front door sidelights. Finally, in 2012, Suffolk County stabilized the building with a new roof and foundation work. Yaphank Historical partnered with the County and provided funding, in part, though grants from the Gerry Charitable Trust, and the Robert David Lion Gardiner Foundation. The nearly $700,000 restoration is expected to be completed this fall. Old lath and new lath are exposed where the plaster has fallen away from years of neglect. Traditional, three-coat plaster restoration is about to begin. A fragment of a mid-19th century cornice molding with swags and garlands, originally gilded at the top, survives in a corner of a first floor parlor. The interiors of the house were high style for the time, despite the rural location. Sarah Kautz introduces the group to the restoration project outside the house. Twenty people toured the house with representatives from the Yaphank Historical Society, a restoration contractor and Suffolk County. Sarah Kautz, Preservation Director for Preservation LI, who created the “behind the scenes” program, did a quick overview of the Homan-Gerard House history outside the house, and then introduced our hosts and guides from Suffolk County—Richard Martin, Director of Historic Services—and for Yaphank Historical, President Bob Kessler and Historian Tricia Foley, who also happens to be the magazine editor, stylist and interior designer (Tricia Foley Design) famous for her all white interiors, as well as author of a multitude of popular books on home design. On the contractor side there was Jeremiah McGiff, an historic house carpenter and antique furniture restorer, who is currently working on the house. Our hosts took us through the house, step by step. They described where the house had been historically, what layers of its material past they are preserving and why, and what the house will be like when the restoration is finished. Most of their restoration decisions take the house back to the early 19th century. The house will be open to the public from the first floor to the attic. Jeremiah McGiff shows the group the shutter up close, where he has repaired damage and restored original material. Paint analysis shows the shutters were originally painted white, to match the trim. McGiff started the tour showing us an original shutter he is restoring for the exterior, and explained how he views them as he would a piece of important furniture to be restored, carefully preserving as much original material as possible, rather than replacing the shutters with new. McGiff also created new windows from scratch, where windows were completely missing, matching the delicate muntins of the original windows. Storm windows will make these windows as efficient as any new insulated glass window. He also showed us original windows he restored as well as new windows where windows were completely missing. Homan House was already in particularly bad shape when the County bought it in 1963. And then it languished for 60 years. Let’s put that in perspective: the construction of the Long Island Expressway was so long ago that most people alive today don’t even remember it being built. At the time the LIE was being built, an access road planned for Yaphank that would’ve required demolishing Homan House was dropped from the construction program. But the house was still scheduled to be demolished, and so it was through the efforts of SPLIA and the Yaphank Historical Society, that Homan House was ultimately acquired by Suffolk County and spared. 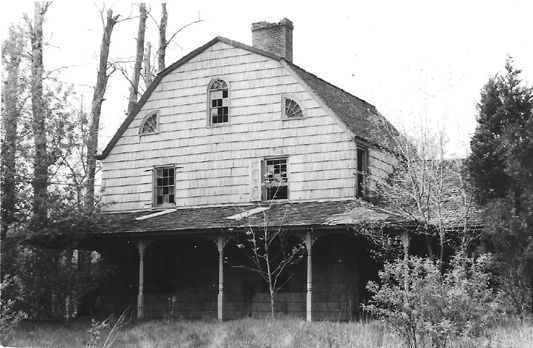 Preservation Long Island (then known as SPLIA—the Society for the Preservation of Long Island Antiquities) did extensive research on the house and documented it in photos in the 1960s. This research and photo documentation proved invaluable to the restoration going on today. Thin square spindles and minimal detailing add to the stair’s elegance, reflecting the thoughtfulness and care of the craftsman who built it two centuries ago. Once the missing pieces are restored, the elegant stair rail will read as one continuous curving piece of wood from the first floor to the attic. Preservation Long Island Executive Director Alex Wolfe (my wife) shows off her “Paint Tape Blue” pants inadvertently color coordinated to the blue paint tape at the second floor hallway. 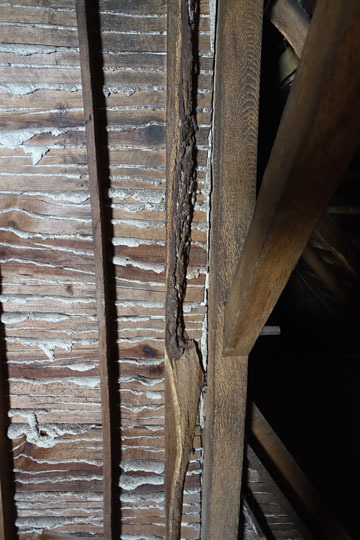 Most of the attic remains intact, with some subtle structural interventions to repair damage from insects. The attic will be open to the public when the house opens in the fall, and well worth the trip. The house, situated on Yaphank Avenue just a block from Yaphank’s Main Street, is adjacent to a lovely millpond that still exists, called the Lower Lake. Like most houses of its time, Homan House is a just a few feet off the road. Pre-LIE, one can imagine how quiet it was there, in this rural outpost far from New York City. At least that’s what one might think at first. In reality, our guides explained, Yaphank was a beehive of activity at the dawning of the Industrial Revolution. Yaphank is geographically almost the exact dead center of Long Island. Powder post beetles did damage at structural wood members in the cellar, now repaired. A temporary steel jack holds up a new steel beam as permanent posts are installed; at the front of the house the rubble stone cellar wall was collapsing and had to be reinforced and new brickwork at the chimneys repaired to make the house structurally sound. 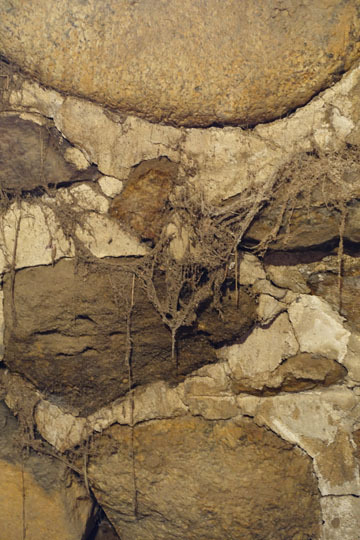 The original rubble stone foundation wall intact;. Mortar was added to the foundation later to stabilize it and prevent water infiltration—roots still found their way in. Damming a part of the Carmans River system at Yaphank created two ponds at opposite ends of the village a mile apart that provided waterpower for mills. Soon other industries and businesses arrived and Yaphank’s residents were among Long Island’s most prosperous. They built several architecturally sophisticated houses to show off their wealth, including the Homan’s who built the first mill in the 1760s a couple of hundred feet from the house. A later generation built the Federal style house with the high style details of the time, including taller ceilings at the first floor, elegant parlors and a dining room. This 1962 photo shows the condition of the first floor front parlor. The first floor parlor today—new lath is in place for plastering, and the mantel shelf will be reinstalled in the coming weeks. This century-long heyday ended by World War I, when the mills closed and jobs dried up. (Yip, Yip Yaphank is the title of an Irving Berlin musical revue written and first performed when he was stationed at nearby Camp Upton during WW I). Yaphank declined and was forgotten, and its once wealthy denizens started renting out rooms in their houses to vacationing New Yorkers, looking to get away from the City. The millponds were the draw for swimming, fishing and boating. Homan House became a boarding house. By the mid twentieth century, that endeavor had collapsed as well. This 1962 photo shows the hole over the fireplace for a potbelly stove at the rear parlor, a later addition that was more efficient than the fireplaces for heating. The stoves were removed from the room each summer and stored. The rear floor parlor undergoing restoration. Paint analysis revealed this deep blue was the original color for one of the parlor mantels. Today, the Homan mill no longer survives. Despite proximity to the LIE, the edges of the Lower Lake remain undeveloped, surrounded by a park. There are beautiful views of this pond from the house, and one can imagine that the landscape looks much like it once did, nearly two centuries ago. The addition at the rear is one of the largest rooms in the house, but it is not clear when this was added. There is an unfinished attic above, reached by a hidden staircase. A detail of the fireplace mantel shows the alligatoring of the paint finish, soon to be restored. The secret stair to the attic from the shed, temporarily being used as storage for paint. We completed our outing to Homan House with a reception at Yaphank Historical’s headquarters at the Swezey-Avey House, where there are numerous exhibitions. This is another lovely historic house facing the Upper Lake that is also part of a well-loved village park. Trim detail at the addition is elegantly simple. 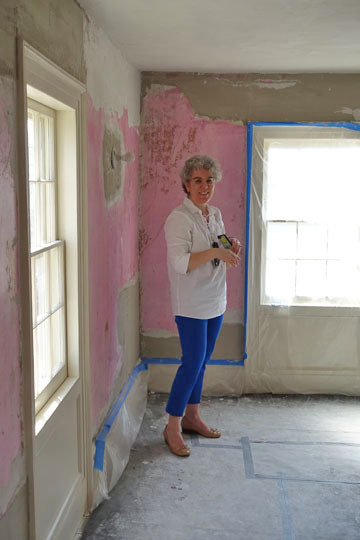 Tricia Foley told me that she moved to the area four years ago, restored a 19th century house, sold it, and then moved to another house nearby dating from the 1970s, that she recently restored. Mid-century Modern in all respects, it was featured in Architectural Digest online last month. As village historian, Trish, as she is known, is an articulate and passionate spokesman for all things relating to historic Yaphank, and for old houses in general, having now added Mid-Century Modern to her repertoire (the 1970s are officially “old"!). As to the coming completion of the Homan House restoration, and its eventual opening to the public this fall—Yip, Yip Yaphank! I can’t wait to be there when the doors open next, to see the restoration completed!